“Buzz, your girlfriend, woof.” That’s how I’m feeling about this one. Florida State just barely managed bowl eligibility after a late season makeup game against UL-Monroe. They lost pro prospect QB Deondre Francois in the season opener and struggled with freshman James Blackman under center since. They also lost head coach Jimbo Fisher who, mistakenly in my opinion, abandoned Tallahassee for College Station. FSU will be playing the Independence Bowl without another potential pro: safety Derwin James. James has decided to skip the bowl in order to preserve his NFL Draft stock; expect James to be in consideration for a Top 10 pick in April although he was surpassed by Alabama’s Minkah Fitzpatrick as the top defensive back prospect. If you’re looking for a reason to tune in to watch the Seminoles, check out freshman RB Cam Akers, WR Auden Tate and CB Tavarus McFadden. McFadden will likely come out but his stock has definitely been dented by the team’s subpar season. McFadden himself disappointed too going from 8 INTs in 2016 to zero in 2017. He’s not great in run support (just 27 tackles this season) so he needs to remind scouts that he has ball skills. Akers has been streaky this season but I would attribute that more to poor quarterback play than anything else. 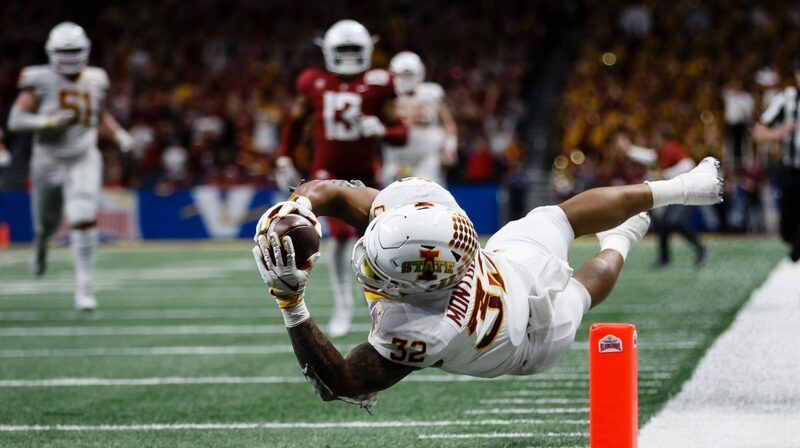 He finished the season with a strong game against UL-Monroe (117 yards, 2 TDs) to give him a solid 931-7 line for the year; interestingly, he has not had a reception in the last three games. 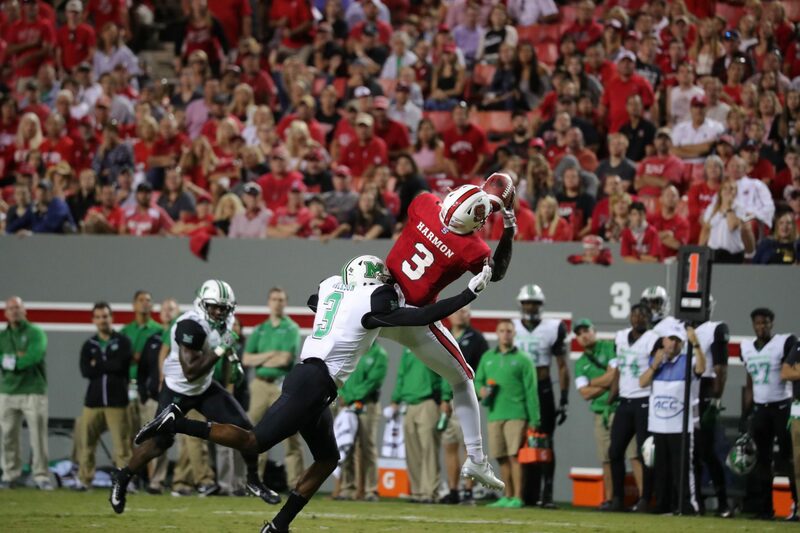 Tate has just 60 receptions, 873 yards and 13 TDs in his career (35-464-7 this season) but is still an NFL Draft prospect because of his size (6’5″ and 225lbs) and ability to make contested catches. Southern Mississippi is led by JUCO transfer QB Kwadra Griggs. He has 15 TDs to just 2 INTs plus 2 rushing TDs. Griggs started the year sharing the starting role and suffered a hand injury but since a dismal game against Tennessee he has played well (722 yards, 7 TDs, 0 INT). I’m a big fan of South Miss RB Ito Smith. He’s undersized at 5’9″ 195lbs but he’s durable (50 career games). He’s a true three down back because he is a good receiver (36 for 370 and 2 scores this season) and a good pass blocker (94.6% pass blocking efficiency per Pro Football Focus). 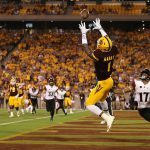 Back in Week 8, I predicted that Smith might be the 2018 version of Kareem Hunt and Tarik Cohen for fantasy owners: an underappreciated prospect whose pass catching skill ensures he gets on the field early in his career. No team influenced the College Football Playoff picture more than Iowa did with their blowout of #5 Ohio State. If it weren’t for that loss, the Buckeyes could be playing for a national championship. The Hawkeyes are led by three guys who will be playing on Sundays next year: CB Joshua Jackson, LB Josey Jewell and RB Akrum Wadley. Jackson offers solid run support (47 tackles), has good instincts when the ball is in the air (7 INTs, 18 passes defended) and is incredibly clutch. 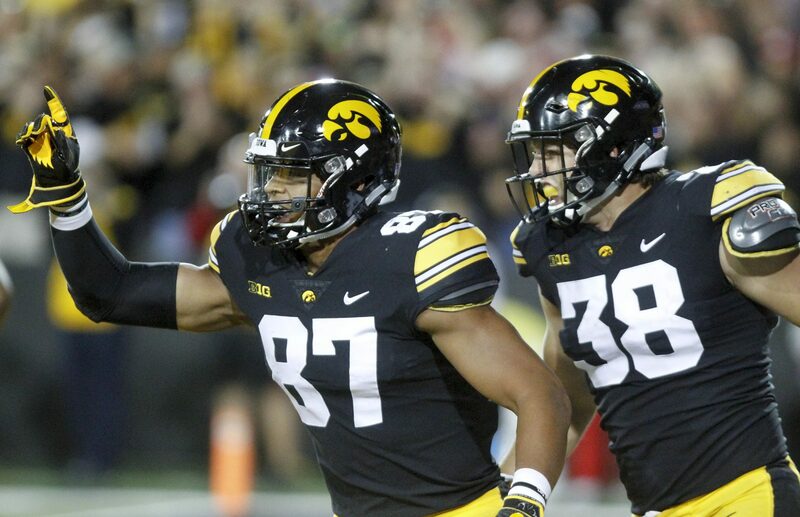 In the two biggest games Iowa played this season, against Ohio State and Wisconsin, Jackson combined for 6 tackles, 1 forced fumble, 1 pass defended, 5 INTs and 2 return touchdowns. One of those interceptions against Ohio State was an OBJ-esque one-hander; another was a hard fought battle with the receiver where he had the strength to rip the ball from the receiver’s hands. Those two games established him as a Top 10 CB heading into the 2018 draft. Josey Jewell enjoyed an equally impressive season that buoyed his draft stock. Jewell has 120+ tackles in three straight seasons and is the conference’s #2 career tackler since 2005 (when www.sports-reference.com/cfb started tracking the record). Jewell also set career highs for tackles for loss, sacks and passes defended on his way to being named the 2017 Big Ten Defensive Player of the Year. Jewell trusts his instincts and play recognition which allows him to be the first to the hole or the ball carrier on most plays. RB Akrum Wadley leads the offense. He went over 1,000 yards again this season (1,021) but his yards per carry did decrease from 6.4 to 4.4. He’s also a factor in the passing game with 62 receptions, 644 yards and 6 TDs over the last two years. In my 2018 fantasy draft positional rankings I had Wadley at RB9 and would expect him to stay in the RB8-12 range when I update in the offseason. Boston College’s best weapon is freshman RB AJ Dillon, other than that the cupboard is pretty bare on offense. Starting QB Anthony Brown is out for the rest of the season (and wasn’t particularly effective anyway). Career backup QB Darius Wade had his best game of his career in the season finale against Syracuse: 16-20, 248 yards and 1 TD. Because of Brown’s ineffectiveness, the Eagles don’t have a WR of note (the leading receiver was Kobay White with 32-396-4). Dillon has gained 1,432 yards (#2 in the ACC) on 268 attempts (#1 in the ACC). Oddly, he doesn’t have a single reception; he had the most carries of any FBS back without a single catch. Dillon has a rare combination of size (6’0″ and 240lbs) and speed (4.55 range coming out of high school) that compares to Leonard Fournette’s combine measureables. Dillon has a way to go before we’re considering him for the NFL Draft but I’m optimistic. Unfortunately, DE Harold Landry likely will not play in this one. Landry will be a first round pick in the Spring but his stock has decreased due injury and decreased production. In late October, it would have been tough to predict these two teams matching up in the Foster Farms Bowl. 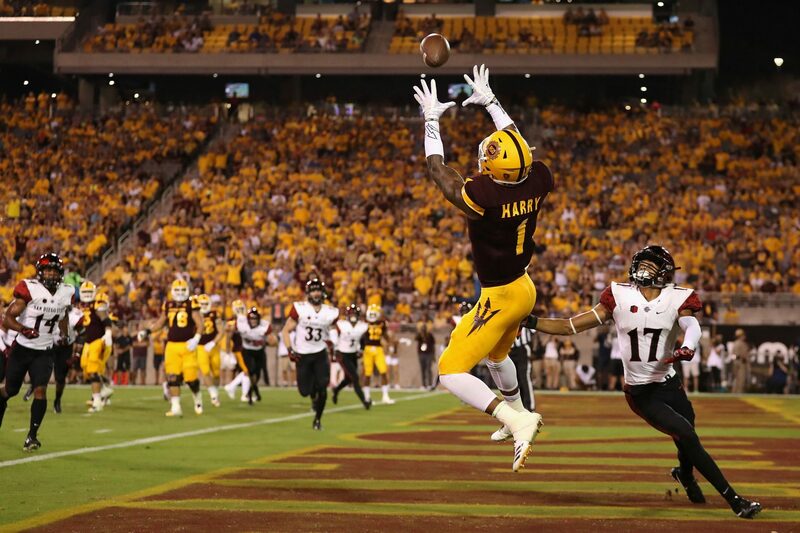 Arizona was 4-1 in the conference (6-2 overall) and looking like a serious contender for the division. Purdue meanwhile was 3-5 and coming off their third straight loss. The fortunes for both teams changed though from that point forward. Arizona lost three of their last four while Purdue won three of four. So, here we are. Purdue head coach Jeff Brohm was one of the many coaches in the running for Tennessee’s opening. Brohm stayed put and used the courting as a bargaining chip to get a better contract. Brohm has used a two-quarterback rotation throughout the season featuring David Blough (1,103 yards, 65% completion percentage, 9 TDs, 4 INTs) and Elijah Sindelar (1,730 yards, 55.6% completion percentage, 14 TDs, 6 INTs). Blough suffered a serious knee injury against Illinois on November 4 and will not factor in here. In the three games without Blough, Sindelar has thrown the ball a ton: 126 attempts. In those three games he has 7 TDs and just 1 INT. 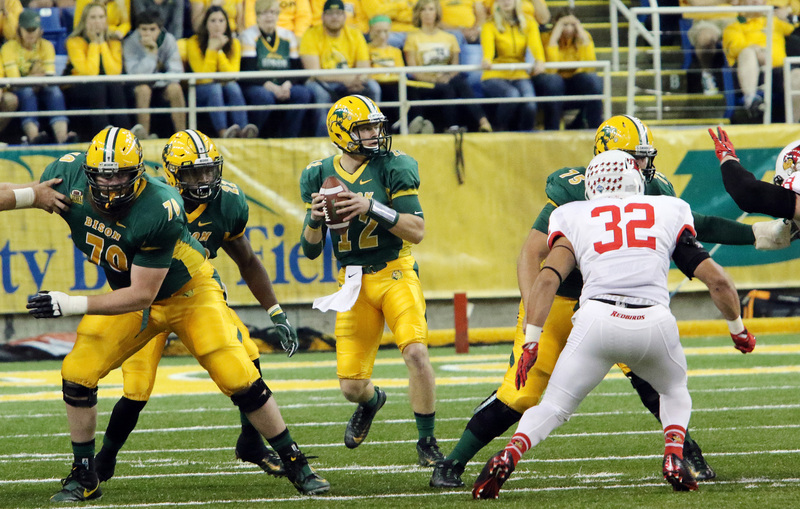 Sindelar’s best game came against #25 Iowa when he went 22-37 for 229 yards and 3 TDs. Hindsight is always 20/20 but maybe if Brohm stuck with Sindelar all season they could have been better than 6-6. The Boilermakers have a quartet of backs with 250+ yards each, the leader of which is junior Markell Jones (480 yards, 1 TD, 11 receptions). On defense, Purdue is led by LB Markus Bailey. Bailey is a redshirt sophomore and likely doesn’t have enough hype to come out in 2018 but if he continues to improve we’ll see him drafted in 2019 or 2020. This season Bailey has an impressive stat line of: 78 tackles, 10 tackles for loss, 7 sacks, 1 INT, 2 passes defended, 1 forced fumble and 1 fumble recovery. Arizona has two players that I wanted to highlight: QB Khalil Tate and CB Lorenzo Burns. Burns is a redshirt freshman so he’s not draft eligible but his stats caught my eye. He has 75 total tackles which is a lot for a corner. He also has 5 INTs which led the PAC-12. Tate took over the starting role in October and led the team to four straight victories. He’s not the best passer but he’s efficient enough to keep the offense on the field until he can make a big play with his legs. Tate threw for more than 200 yards just once this season and averages about 150 yards per game. Amazingly, he actually has more yards rushing (1,353) than passing (1,289) on the year. He has 9 passing TDs and 12 rushing TDs. Tate’s biggest game of the year came against Colorado when he racked up 327 yards rushing and 4 TDs. Something that is worth noting: Tate only has 60 total rushing yards over the last two regular season games. I did not watch him in either contest so I cannot say whether it was due to scheme or maybe he has a minor injury. The Texas Bowl features two former conference foes in Texas and Missouri. The teams last faced off in Big 12 play in 2011 before Mizzou left for the SEC; Texas leads the all-time series at 15-4 (not that it matters, these players were all in middle school, but it’s just interesting to see teams matching up with so many prior meetings in a bowl game). Despite the teams having a combined 13-11 record, I found quite a few interesting storylines to research. Texas started the season with sophomore QB Shane Buechele as the starter but they have gone back and forth between him and freshman Sam Ehlinger due to injury. Neither guy has been great: they combine for 3,153 yards, 16 TDs and 11 INTs. Based on the raw passing stats, Beuchele is the better play in the bowl game but Ehlinger offers a dimension as a rusher (364 yards, 2 TDs). Since the start of bowl practices, both quarterbacks have reportedly been getting first team work. My money would be on Ehlinger since he was the primary passer in the team’s last two games (66 attempts to Buechele’s nine). WR Colin Johnson will be the main target no matter who is under center. 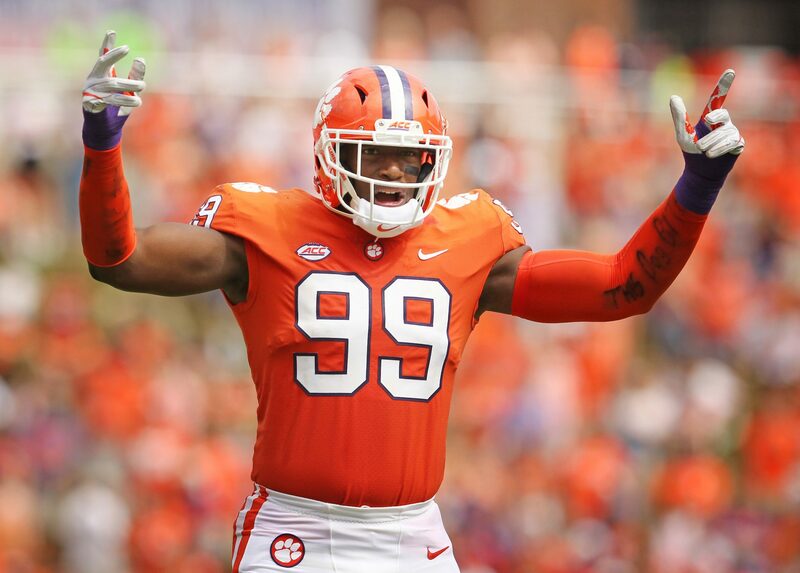 Johnson is huge (6’6″ 220lb) but just a sophomore so thankfully he’ll have another season to improve before hearing the siren song of the NFL Draft. 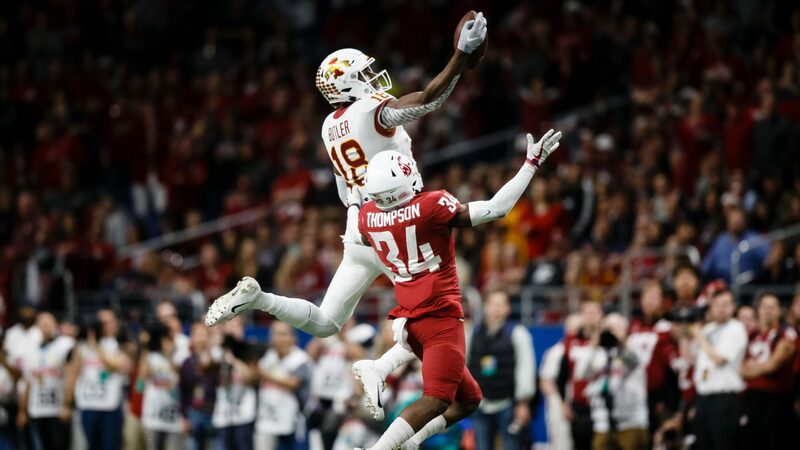 Johnson has 79 receptions, 1,050 yards and 5 TDs so far in his career – not amazing but encouraging given the struggles of the Texas offense the last two seasons. The Longhorn running game is a mess. Ehlinger is actually the team’s leading rusher by both attempts and yards, although he’s not very efficient as he averages just 3.5 yards per attempt. Chris Warren, a big and bruising back who was slowed by injuries early in his career but looked promising, changed positions mid-season and is now transferring. Freshman RB Daniel Young finished the season as the lead back with 58 rushes for 238 yards and 2 TDs over the last four games. Leading the defense is LB Malik Jefferson who is one of the nation’s leading prospects at ILB. Jefferson has 110 tackles this season. Jefferson flashed in my eyes when playing against Sam Darnold and USC early in the season (he had 11 tackles and 2 tackles for loss). He had six double-digit tackle games on the season and added four sacks. 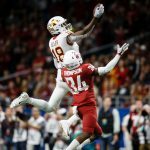 Jefferson measures in at 6’3″ and 240lbs with a projected speed of 4.72 per NFLDraftScout.com. Similar size and speed comps include a number of key IDP players: Sean Lee, Kiko Alonso, Blake Martinez and Nick Vigil. Phil Steele’s preview magazine listed him as the #1 ILB for 2018 while NFLDraftScout.com has him listed as their #2 ILB in Jefferson’s 2019 class. Chances are that he comes out and that he is a Top 15 pick. Missouri’s season has been one of streaks. They started the season with a loss over FCS also-ran Missouri State then lost five straight then won six straight. Stories of the team’s turnaround all point to head coach Barry Odom as the rock that keep the team on track despite the struggles. I don’t know Odom from Adam but it seems that the players love and respect him so that’s what matters. Throughout Missouri’s winning streak, I continually wanted to spotlight QB Drew Lock but I never got the chance. Lock is a three year starter who has improved on his stats year over year. In 2017 he finished the regular season with 3,695 yards, 43 TDs and 12 INTs. His completion percentage could be better (just 58.2%) but there is enough potential there to consider him as a draft prospect. Lock is listed at 6’4″ and 225lb and will run in the 4.80-4.90 range at the combine should he declare. Unfortunately, there aren’t many good comps in that size range, the best likely being AJ McCarron. McCarron did not produce like Lock has though. Lock led the SEC this year in attempts, yards and passing touchdowns (he also led the FBS in passing touchdowns). I’ll do more research and film study on Lock in the offseason if he declares, for now he’s definitely a player to watch. Lock’s top target is WR J’Mon Moore. In three years with Lock throwing him the ball, Moore has totaled 151 receptions, 2,389 yards and 21 TDs. His production in 2016 and 2017 was nearly identical, essentially 60 receptions and 1,000 yards. Moore won’t be a draftable WR fantasy rookie but could get late round NFL Draft consideration because of his height (6’3″). Since I was using Sports-Reference.com’s “Rivalry Finder” tool to look up the Texas/Missouri matchup I figured I might as well check out Virginia/Navy as well since that felt like a natural rivalry given the geography and military connections (it’s no coincidence the Military Bowl picked either team when given the chance). Turns out that the teams have met 33 times in their history but not since 1994. For what it’s worth, Navy leads the “rivalry” 23-10. Navy is coming off a tough loss to Army on December 15 so there could be a bit of a “hangover” in this one. Even aside from the Army loss in the snow, the Midshipmen have been cold as of late, winning just one of the last seven. As most casual college football fans know, Navy, like the other service academies, runs a rush heavy triple-option offense. So, it’s no surprise to see Navy with two 1,000+ yard rushers (and another at 500+). What might be surprising is just how often the quarterback keeps the ball, eschewing his two other options. Junior QB Zach Abey leads the team with 1,325 yards rushing and 14 TDs (plus 805 yards and 7 TDs passing). Abey missed time during the season with both a concussion and a shoulder injury. In his stead, sophomore QB/WR Malcolm Perry emerged as the primary playmaker. If you watched the Army vs Navy game, you’ll no doubt remember Perry. Perry is not a threat to pass (just two attempts) but he is electric with the ball in his hands, so much so that when Abey was healthy Navy got Perry involved as a a receiver (13-303-2) and as a kick returner (24.5 yards per return). Even if Abey is fully healthy, expect to see more of Perry. Bronco Mendenhall’s Cavaliers improved significantly after a 2-10 campaign last season. It’s the first time UVA has been bowl eligible since 2011 and just the second time in a decade. Leading the offense is senior QB Kurt Benkert. Honestly, I did not know Benkert’s name to start the season but he had enough success this year (3,062 yards and 25 TDs) that he’s been getting some buzz. I have not watched Benkert’s film so the bowl will be a good introduction against Navy’s mediocre pass defense. Benkert’s favorite target is the versatile Olamide Zaccheaus. Zaccheaus has 80 receptions for 833 yards and 5 TDs while adding 182 rushing yards and a rushing score. 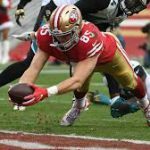 Earlier in his career he also returned kicks and even threw a touchdown pass in 2015. He’s the type of player that offensive coordinators love scheming for. On defense, UVA features two mid-round NFL Draft prospects in LB Micah Kiser (132 tackles, 5 sacks this season) and S Quin Blanding (120 tackles, 4 INTs this season). Both players are mutli-year starters who have nearly 900 career tackles between them. Kiser and Blanding will be key against the Navy rushing attack. In their November 11 matchup, Virginia held the Georgia Tech triple-option offense to just 220 yards. Just 220 yards you ask? It may sound like a lot but it’s the fourth lowest total of the season for Tech, so Virginia’s defense played well considering. In that game, Kiser had 18 tackles while Blanding had just three but added an interception. It’s not quite the “Grandaddy of them all” as Keith Jackson would say, but this Big Ten vs PAC-12 matchup is a good one. I’m a Michigan and Rutgers fan, a Big Ten apologist and huge Rose Bowl fan. My favorite pieces of memorabilia are a program and press pass from the 1998 Rose Bowl when Michigan won a share of the national championship; I found the pieces in a used bookstore in Ann Arbor, bought them immediately and had them framed. So, you can see I’m a sucker for a Big Ten vs PAC-12 matchup. I’ll call this one Rose Bowl Lite. Michigan State’s mediocre offense is led by QB Brian Lewerke and RB LJ Scott. Lewerke is a redshirt sophomore who is starting for the first time this season. He has 2,580 yards, 17 TDs and 6 INTs plus 489 yards rushing and 5 rushing TDs. Lewerke finished mid-pack in the conference in most passing statistics so he’s solid but he’s not on the level of recent Spartan QBs like Conor Cook and Kirk Cousins. Scott started the year with some hype but he mostly disappointed. 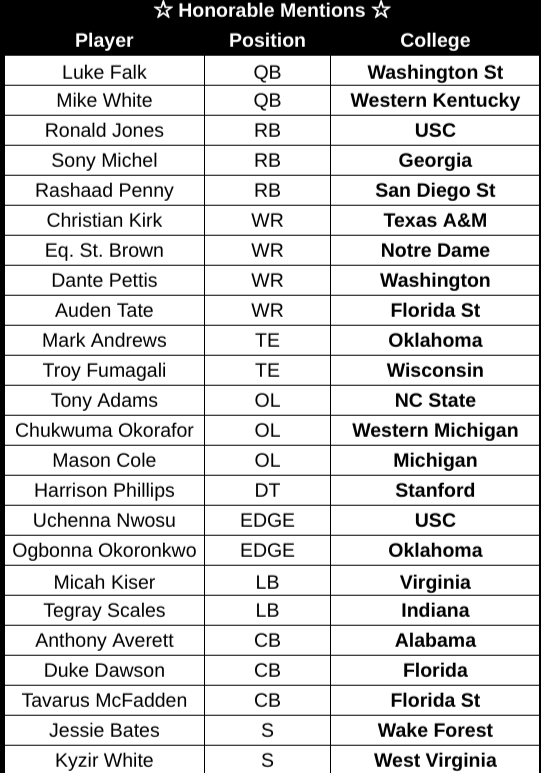 In my early 2018 rookie mock draft, I had Scott as my 2.05; I had him ahead of other backs like Sony Michel and Ronald Jones who are definitely ahead of him now. A running back of his size should see more TDs because of his utility near the goal line. In 2016 Scott had just 6 TDs and he duplicated that output in 2017. That’s just not good enough. Scott did injure an ankle during the season but he was actually dressed and active for the Michigan game that he supposedly missed due to the injury. I didn’t believe this when I first read it while doing my research but Scott was arrested in October for his seventh charge for driving without a valid license. That is staggering. I don’t know Scott and don’t want to cast aspersions but how can you be so irresponsible? Either get your driver’s license right or stop driving. If Scott is convicted, which I doubt would happen but who knows, he could face jail time. Oh, I forgot to mention that despite being the primary ball carrier in each of his three years, Scott has failed to break 1,000 yards in a season. Between the poor production, a small injury concern and an alarming pattern of behavior, I am out on Scott if he does declare early. I would rather miss on him than draft him in my league and deal with dead cap if I have to cut him. On defense, Sparty’s heart and soul is sophomore LB Joe Bachie. He has 94 tackles, 7.5 tackles for loss, 2.5 sacks, 3 INTs, 2 forced fumbles and 1 fumble recovery on the season. 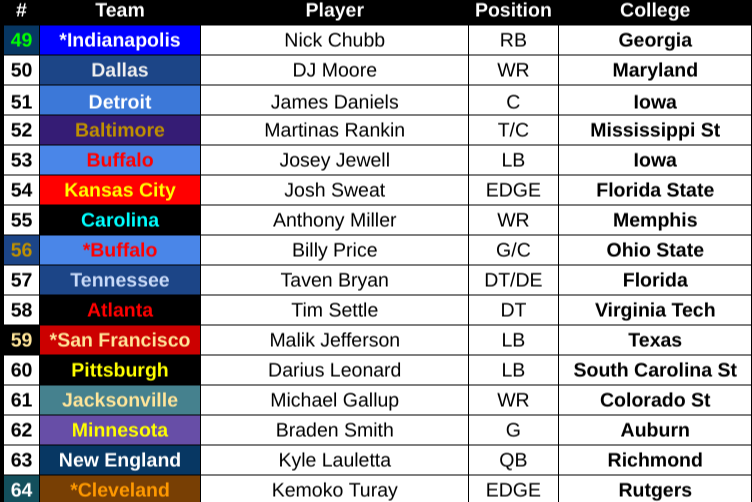 Cougar QB Luke Falk was my QB4 in early November when I did my early positional rankings for 2018 rookies. I will probably bump Falk down a bit (or more accurately, bump Lamar Jackson and Baker Mayfield up a bit) but that doesn’t mean I am down on him. Depending on his landing spot after the NFL Draft, I would consider drafting Falk late in my superflex leagues as a stash. Falk is a three year starter at Washington State and has incredible career stats: 1,403 completions, 14,481 passing yards, 119 passing TDs, 39 INTs and a 68.3% completion percentage. Falk’s stats did decrease a bit this year so that concerns me slightly but not enough to push him off my board. Falk’s best attributes are his experience, size and accuracy – those traits will definitely get him drafted to be a backup behind an aging vet. Washington State doesn’t bother running the ball too much (second worst rushing offense in the FBS at 71.1 yards per game) but that does not mean that RBs Jamal Morrow and James Williams are worthless. Both backs excel in the passing game with 898 combined receiving yards. The team’s leading receiver is junior Tavares Martin (70-831-9) but Falk spreads the love around because five guys have 50+ receptions. One other prospect to keep an eye on, not that you could miss him, is G Cody O’Connell. O’Connell’s nickname is “The Continent” and he deserves the title because he is listed at 6’9″ and 354lbs. It’s odd to see such a big guard and that could be telling that he’s not playing tackle. 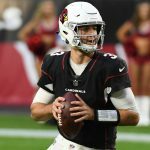 Per WalterFootball.com, one of my favorite draft resources, team sources think O’Connell will go undrafted. Reading that tempered my excitement but still how often do we get to see a 6’9″ player?